Student entrepreneurs of the future had a chance to practice their pitching skills at a competition yesterday in London. Over 50 students from five universities took part in the event, organised by SETsquared, the University of Bath and Deloitte. At the event, held at Deloitte’s UK headquarters, the students took part in a workshop on ’how to make a winning pitch’ and then put this into practice as they pitched their businesses to a panel of judges made up from Deloitte consultants. Each pitch was five minutes long, followed by five minutes of questions from the judging panel. SETsquared is the enterprise partnership of the Universities of Bath, Bristol, Exeter, Southampton and Surrey, and yesterday’s event was part of a programme it provides to help students at the five universities to develop their business and entrepreneurial skills. The event provided student businesses the opportunity to network and learn from each other’s businesses. It also gave the participating students a chance to spend time with Deloitte, and find out more about working for the company. 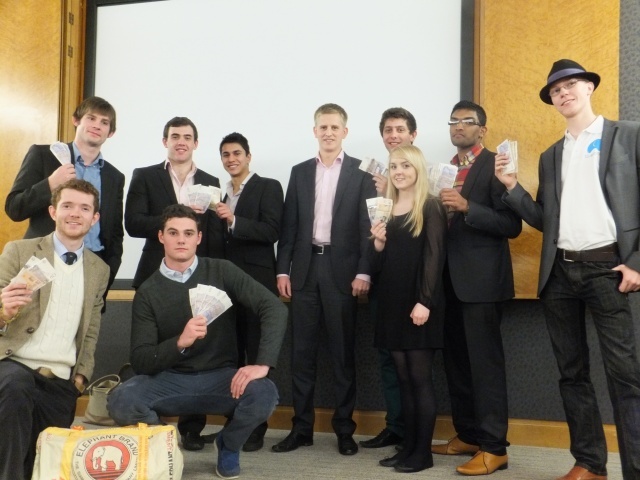 As well as gaining valuable feedback from Deloitte, the participants were competing for cash prizes totalling £500. One participant, Tom Dewhurst with his company Child Identification Program, was also given the wildcard place for the final of the Bath Business Plan Competition by the judges. Twenty-nine businesses were pitched at the event. Most of the companies were less than a year old but already trading, and some were turning a profit. The most valuable part of the day was the opportunity for the businesses to do business with each other. One example was Whike, from the University of Exeter, who met Pedal Power Transport, from the University of Bristol, and are now discussing them testing their new sail assisted bike. In another example, social enterprise Elephant Bags, from the University of Bath, were going to share their knowledge of production and company development to assist social enterprise Every Foot Has a Home, from the University of Exeter.